In the last post I explained all about one of my favorite books yet this year, Jesus, My Father, The CIA and Me: A Memoir…Of Sorts by Ian Morgan Cronan (Nelson; $15.99) Skip back and see my rave review–I loved it! (And we have it on sale for BookNotes readers.) I was eager to tell you about it anyway, but I’ve been writing just a bit about the pleasure books can bring—thanks Alan Jacobs!—and this one was a heckuva fun ride. Here are a few more that I’ve read lately, books that I just didn’t want to end. Each illustrate the quality of insight and well crafted writing that draws readers in and that serious book lovers will certainly appreciate and perhaps, as I did, find irresistible. I hope you’ll give ’em a try for your summer reading pleasures. 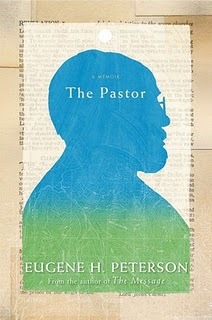 The Pastor: A Memoir Eugene Peterson (HarperOne) $25.95 in hardcover; $28.98 in unabridged audio CD. I’ve mentioned this much-discussed book before and it nearly goes without saying that we appreciate (adore?) Pastor Pete and his important contribution to spirituality, pastoral integrity, real-world grittiness, prophetic distance from the worst traits of what might be called the American Way of Life, and a solid Biblical-rootedness. One particularly cult-ish fundamentalist website that was telling their readers to avoid our recommendations once noted that I said that Peterson had an earthy spirituality. Aghast! (As I read my Bible—from good creation to real fall to bodily incarnation to gritty discipleship until the real new Earth—that is the only kind that is faithful.) But they thought I meant Earthly which they dumbly took to mean worldly, as if we intend to affirm a compromise with the sinful ways of this present order. Which is why we need to read Eugene Peterson: he combats, in nearly every sentence and every story, any pious nonsense that is built more on sentimentality or neo-gnostic visions of flying away to heaven. He is Reformed in the broadest sense, believes that God is with us here and now, and believes that the life of the Christ-follower will be a doxology to the Lord in all we do. Which is to say, we glorify God best by being down-to-Earth and serving Christ in the daily grind. For Peterson, though, as we find out in this long-awaiting memoir, he comes to this by way of his own callings, first in a Montana butcher shop and later as a frustrated academic, and finally in his most lasting vocation, that of being a small church pastor in a small town in the outskirts of Baltimore MD. The Pastor rings true to what we know of Peterson through his many books—A Long Obedience in the Same Direction, or one of my favorites, Where Your Treasure Is: Psalms That Move Us from Self to Community for instance, or his work on prayer (Answering God) and his five volume set for pastors on “vocational holiness.” And then there is the magisterial five book series called “conversations on spiritual theology” which are meaty, mature, to be savored and pondered. Oh yes, he did that paraphrase of the Bible, too. Anybody ever hear of The Message? Here he tells how it came about, starting off in his church basement over coffee cups and his ordinary folk finally coming alive to grasp the Scriptures (it was Galatians, by the way, that he did first), the year spent in Pittsburgh Theological Seminary as a writer in residence, and so much more. As in any good story about a person’s reminiscences, he tells of his parents and his dearest relationships. He write about meeting his wife, Jan, and their early marriage. He notes the ups and downs of their first careers, her calling to be a pastor’s wife, and their partnership in trying to forge a community that worshiped well, prayed and read Scripture, and let the life of God saturate their ordinary days. This is a book for anyone who has been involved in church, anybody frustrated with how churches—liberal or evangelical, higher or lower liturgically speaking, large or small—have been run in recent decades. Peterson is nearly gruff in his insistence that we not forfeit quality for quantity as we are wont to do; he is all about staying true to the story as found in the text. Learning how he grew so impassioned, how he matured as a writer, how he followed the Spirit’s leading into such highly regarded work is good for anybody. The writing is often glowing (in a plainspoken sort of way; he is never ostentatious, but it is well crafted and at times lyrical.) There is little doubt that he is one of the most important Christian writers of the last 50 years, and his story was waiting to be told. â€¨As I’ve said before, we are acquainted with Eugene and he is kind enough to say good things about us. We are grateful for his business and grateful for his encouragement. But even if you’ve hardly ever heard of him, haven’t read any of his many books, and aren’t drawn to reading about Christian leaders, we’d commend this whole-heartedly. Loved it. Didn’t want it to end. Learned a lot, took comfort from some portions, laughed out loud more than once. It is a slow, pleasurable, thoughtful biography, one that is going to be considered by many as one of their favorite books of 2011. Here is a brief interview with him from Neue Magazine Here is a podcast interview with him conducted by Christie Tennent of IAM. Making Toast: A Family Story (Ecco Books) $12.99 The wonderful mind and great writing of Roger Rosenblatt came powerfully to our attention a decade or more ago when someone gave us an audio recording of a spectacular talk he did at Chautauqua Institute that ended memorably with people calling out their most treasured books from their childhood. In a final scene of participatory art, the audience shouted out the most moving words. It was a stunning talk, inspiring to this young bookseller, and I continue to watch his work over the years. You may know him from the New York Times columns or his Emmy Award winning work with Jim Lehrer on PBS. Wikipedia nicely compiled some of the accolades about him. children, died at age 38. Rosenblatt and his wife moved back to the DC area to move in with their bereaved son-on-law to help raise their grandchildren. His own grief and grandfathering story is told in last year’s Making Toast: A Family Story. Again, it is one of those books that I found myself longing to pick back up—couldn’t wait for the end of the day (which doesn’t come nearly early enough for me, here, often typing still at 2:00 am.) Still, I grabbed it whenever I could, not wanting to bite off too much. It was just so good, so touching, so intimate, so honest, and so very interesting. He does have an interesting family. And a great eye for details told well. It was heartbreaking in quiet moments, but the writing was restrained. It was, as I’ve suggested, a pleasurable reading experience, one I commend to you. This YouTube interview doesn’t do the book justice, but you can watch him for a few minutes. Mr. Rosenblatt has sworn off any notion of God–it comes up from time to time–yet he is a decent and funny man, and he was a good father, a fine husband. The extended family stuck together through the hard year after Amy’s death, and the tales told of this upper middle class literary family rung true, even though it was not my world or my worldview. Did I say I could hardly put it down? Did I say it was one of the best books I’ve read all year? That I enjoyed it? Kudos to Mr. R for his writerly ability–rooted surely in some deep and mature sense of the meaning of things, character and goodness and such—to mix great sadness and great joy, to share a story so universal, even in its particularity. What a book. If he asked me this year, about books that touched me deeply, that have meant something to my soul, I would shout it out, as he invited listens to so many years ago. Making Toast, I’d shout. Make that toast! 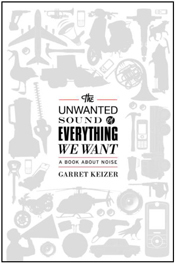 The Unwanted Sound of Everything We Want: A Book About Noise Garret Keizer (PublicAffairs) $27.95 Some authors are so elegant, so thoughtfully creative, so seemingly wise that they are able to write about any number of things. Garret Keizer is one such writer, whose first book was a literate and thoughtful memoir of being a small town pastor (Dresser of Sycamore Trees: The Finding of a Ministry.) He wrote a highly acclaimed book on caring for others simply entitled Help. I really respected one he did called The Enigma of Anger. I guess he is a true humanist, in the best sense of the world, some sort of writerly renaissance man. He obviously has a good heart and a fine ability to ponder some of the deepest things of our human days. â€¨â€¨In this newest one I was hooked on the first page. He talks about how unwanted sound–and boy, there is a lot to learn about that!—is considered a weak issue. It isn’t as horrific as genocide or the plague of world hunger. Yet, if often hurts the weak, the oppressed and the poor, the infirm and the aged and the young. Early one he tells some very frustrating stories—people who cannot sleep because of a neighbor’s loud swimming pool pump, dangerously high decibels in children’s toys, the hearing loss prevalent among returning soldiers. These are hard to take, small injustices, yet are (if you will excuse the pun) quietly told. Keizer builds a gentle a moving case, carefully. â€¨â€¨And, this book is instructional in a profound way. Yes, we learn a lot about sound and decibel measurement and all manner of mayhem in our modern world, but we also come to realize that much of the noise is, in fact, a result of the other stuff we want. Our industrialized, fast-paced, increasingly mechanized way of life necessarily steals our solitude. The psychic toll is considerable. Garret Keizer has, not for the first time, helped us look hard at something we thought we understood and see that instead it’s rich, fascinating, full of political and moral and human implications. I’d say that his argument goes off like an intellectual explosion, but perhaps better in this context to summon the image of a bell, struck once in the silence. This is a book for our precise moment on Earth. So, The Unwanted Sound of Everything We Want is a book that is quite satisfying. I like a little fire, and “disputatious moral eloquence” from time to time. And I like social history and intriguing stories and well-placed episodes well told, illustrative examples of his point, alongside tons of interesting information. Keizer is, as I said, a fine, fine author who has covered a lot of ground in his writing career. This book is a masterpiece, the sort of thing to ponder, either in a noisy beach, or perhaps a secluded cabin. Or carry it on the bus as you commute. Wherever and in whatever condition you read it–probably not in true silence–you will be glad you did. I’m not quite finished with it myself but I can tell, when it is over, I will be glad for his good gifts, hungry for more, and wondering out loud what in the world he will write about next. For now, check out this Book TV talk about the book, then order it from us! gave. I’ve read the first 30 pages three times (and not because it was so confusing, but because it was so very wonderful.) Look, I know thirty bucks is a lot of cash for a mere 30 pages. But I mean this: the 5 page introduction is itself worth the price of the book. I want to photocopy them and turn them into a booklet. What joy to find such interesting reflections that will pay off in opening up a good chunk of the Scriptures! This is priceless stuff, wonderful insight about the nature of nature—the creation, the Bible calls it!—and our alienation (or at least distance) from it. â€¨â€¨They start out with a splendid, splendid excerpt of a C.S. Lewis book on medieval literature. I cannot print the long quote here, but basically Lewis says we modern day folks simple cannot appreciate the terror felt by people during a dark night before the invention of lights. Go out and stand for several hours in the deep late night dark, and then try to read ancient literature, Lewis suggests. Well Bartholomew and O’Dowd counsel the same thing for anyone wanting to read the Biblical wisdom literature. How can we possibly get the creation-based theology of Proverbs, that magnificent portion about God’s sovereign rule of creatures at the end of Job, the exuberant praise of Psalm 104, say, if we don’t walk around as fellow creatures in a God-drenched world? (Very close readers will pick up some of Calvin Seerveld’s insights from Rainbows for the Fallen World here; yep, this is so, as Bartholomew studied under him. O’Dowd studied with Cal’s colleague Al Wolter’s, author of Creation Regained.) Walk around outside a bit, they say, and then come back and finish the book. It’s a good point, and they mean it. Close. The. Book. Go. Outside. Experience creation. This is going to be a very cool commentary. So, these two gents are fine writers, attuned to how the whole unfolding Biblical drama can serve to place us in God’s world: the redemptive work happening in and through Christ, as narrated by the Scriptures, understood firstly in their Middle Eastern context, can be our own narrative. We can find our place in the world, thinking Christianly, as it were as that story becomes our story. But, alas, to do this we need more than just a quick read through of the printed page. We don’t just want Bible information, we want Godly wisdom. Job, Ecclesiastes, Psalms and Proverbs, properly understood, can make us wise; they can orient us in ways that allow us to take up our role in the story. A good part of that–our living into the redemptive story of God– is how we interact with the creation, God’s ways of ordering it and how even our work in modern jobs and institutions can be a response to the wise ways structured into life as we know it. Knowing about wisdom opens up whole vistas of understanding. Jesus, as some are quick to say, is the very wisdom of God. I’m grateful for the good chapter with that title in OTWL, and glad that Bartholomew & O’Dowd have a strong, Christo-centric reading; Old Testament Wisdom Literature does not traffic in moralism, in formulas, in cheap grace. It is radical, multi-faceted, and, well, deeply wise. It has received rave reviews from some of the finest Old Testament scholars of our day (like Bruce Waltke, Tremper Longman and John Goldingay.) It is the best thing I’ve read on this topic. If you are turned on by learning, if you want to know your Bible better, if you hunger for good writing, good thinking, faithful exegesis that always is applied in a storied way, helping equip you for faithful living in these days, this book could be a great companion for a few months or so. Maybe, like me, you’ll read and re-read, underline whole paragraphs, quote and share and celebrate this with anybody who will listen. 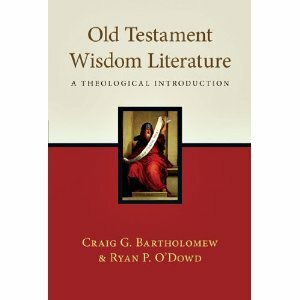 Old Testament Wisdom Literature: A Theological Introduction is a great book, Biblical scholarship at its finest. And you’ll appreciate it all the more if you do what it says: close the book and go outside for a spell. The fear of God is the beginning of wisdom the text reminds us. Consider God’s awesome, fearful, creation, and our small place within it. And then ponder who God is. And then come back to the book as Bartholomew & O’Dowd guide you on the journey through some familiar (and some not so familiar, for many of us) Bible passages, opened up with extraordinary insight and contemporary relevance. I’ve not finished this yet but I am sure I will name it as one of the best books of 2011. Yay.